It's been 12 years since Seattle Opera last presented The Magic Flute, and while next month's run of this popular Mozart opera is a new production, it does have at least one thing in common with its 1999 predecessor: tenor Doug Jones, who returns in the role of Monostatos. Since then, Jones has appeared several times on the Seattle Opera stage, including a few previous productions working with Chris Alexander, who directs this Magic Flute. We asked Jones what it's like to collaborate with Alexander again, and also talked to him about the character of Monostatos, along with what it is he loves about Mozart's music. So far, how is this Magic Flute production and experience different from the last time around in Seattle? In 1999, we were using an existing production (Scarfe's production from L.A.) that, as a total package, was pretty much predetermined. Now we are creating something new—a completely new set shaped by a new concept or vision for the piece, and the costumes from San Diego are also being re-thought and modified. So this time there’s the sense of making something new, which of course I prefer, as anyone would. Also, the production in 1999 was my first Flute; this production is my fifth (Kansas City, Bordeaux, and Toulouse, with two more this year, in Israel and Austin). I'd like to think I have figured out at least what I want to do with the role, and how I wish the character to be portrayed. Back then, I also had the sense of being the beginner, to some degree, as it was my first Flute, only my second opera in Seattle (after Tristan), and my colleagues were very much seasoned professionals (Cynthia Sieden, Gabor Andrasy, Nathan Gunn, Anna Maria Martinez). This cast now is primarily younger singers at the beginning of their careers, and I am the old hand, as it were. 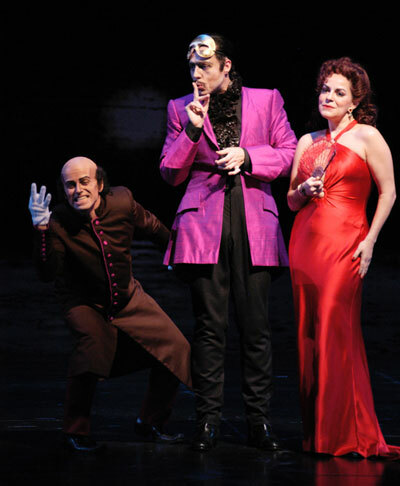 Doug Jones as Pitichinaccio in Seattle Opera's 2005 production of The Tales of Hoffmann, along with John Relyea and Nancy Fabiola Herrera. 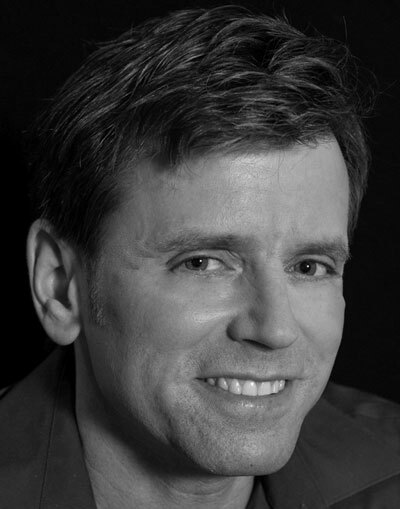 You've played eccentric characters in several previous Chris Alexander productions at Seattle Opera (the Tanzmeister, Hoffmann's four weirdos). Which of you is responsible for the entertaining wackiness of these figures? Well, I hope the characters are memorable. That is certainly my goal, as well as Chris's. We certainly do not consider them "wacky"—or better said, we do not dwell on their wackiness. We try to find the human qualities in outrageous (or bigger-than-life) characters. Our first collaboration was for the Holy Fool in Boris Godunov, and although it was my first time in that role, I had sung Missail in two other productions; I felt secure enough in my understanding of what the role was "about," but also open to his ideas. And really that’s the ideal situation—knowing what the role is, understanding what the character does in the opera and why, and having an open mind about the possibilities. Chris is very good at bringing out the aspects that best SHOW an audience a character's story. Like all good directors, he will use a performer’s qualities to express the character's feelings, rather than impose his own physical language or interpretation onto a performer. It is a wonderful marriage of two creative minds—at least I hope so; it should be difficult to see, I hope, in one of our characterizations, which ideas are his and which are mine. So, the short answer is, our characters come from both of us. It is a true collaboration. We trust each other implicitly, having worked together as we have, and that is what truly nurtures creativity. 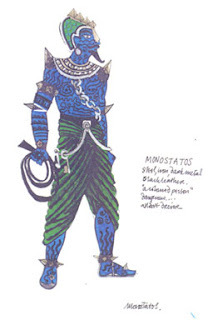 A sketch of the Monostatos costume that will be used in this Magic Flute, by fashion designer Zandra Rhodes. Do you find Monostatos sympathetic? Why is he the way he is? Well, he is not evil. I read somewhere that Monostatos is the only person in the opera who doesn't lie. There is a reason Sarastro trusts Monostatos to be commander of his guards/slaves. He is a Moor, so he is an outsider within the society of the opera. He is the victim of unrequited love for Pamina. So there is a lot there to grab onto and make personal, to the degree that the performer wishes. There is certainly much to explore. What is interesting is that you never know how a director will see the character. Some want a serious romantic lover and threat for Pamina, some want a clown. You can do it either way and, no doubt, countless other ways. Ideally there should be a balance between the funny, dangerous, and wounded elements. He is the way he is because he is longing to be loved. And when it is denied him he resorts to desperate actions. Word on the street is that you're an inhabitant of Queen Anne. What is it you like about this neighborhood? I like being able to walk to the opera house. Living in Europe, I learned the value of being able to walk to performances, with no worries about strikes or subways not working. That was the initial reason I located there. But I love the area of lower Queen Anne. It is not crazy busy, it is relatively safe, and feels like a settled community. It seems to be losing a bit of its quirkiness with all the recent development, but I still like the area very much and cannot really imagine living somewhere else while working in Seattle. 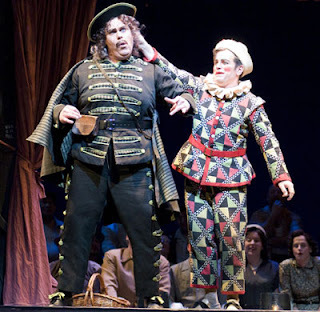 Doug Jones (on the right) as Beppe in Seattle Opera's 2008 production of Pagliacci. On the left is Mark Holland as Tonio. What Mozart do you sing, other than Monostatos? Is he a favorite composer of yours? Mozart is very important to me though I do not sing enough of him. I lived in Vienna where Mozart is king (perhaps there is a trifecta of Mozart, Strauss, and Strauss), and I have also worked on many of Mozart's more serious tenor roles (things I would not sing in public) simply for vocal technique. I think it is basically true that if you can sing Mozart well, you can sing anything. I have done a lot of modern opera, and I remind myself constantly to sing it as if it were Mozart. That is something an audience member would not consciously notice; it is a frame of mind for singing. I won't get into singing technique or philosophy, but it basically is about not changing vocal production to go after notes—to keep a steady line in the voice, make it even and musically expressive. I have done a lot of Pedrillos in The Abduction from the Seraglio, and a few Basilios/Curzios in Marriage of Figaro. Along with Monostatos, those are the limit of my Mozart roles for my "fach." I have learned arias from Titus, Idomeneo, and Don Giovanni, which I use as technical exercises. But I have no pretensions as to my ability to sing the lyric tenor Mozart roles; I only hope that my character tenor roles will also be beautifully sung as well as expressive.